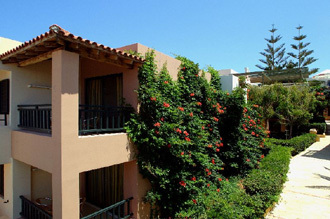 Castello Village Resort is built in a traditional Cretan village style. With its rich gardens, panoramic sea views, and imposing mountain backdrop, it is the perfect destination for a peaceful family holiday. The hotel's buildings are laid out like a village, with each studio and apartment self-contained for privacy and comfort offering the highest standards of comfort and relaxation at this popular holiday destination. Located in the picturesque seaside Village Of Sissi he hotel is only a few steps away from the lively shopping street of Sissi with its numerous bars, coffee shops, tavernas, restaurants, souvenir shops, and boutiques. Studios consist of a combined living room and bedroom, with a sofa bed and either two single beds or a double bed, all fully equipped. Apartments Type B or Type C with 2 or 3 spaces/ rooms: Like studios, except that the bedroom(s)is / are separated from the living room. Junior Suites: Luxury units with two or three spaces / rooms. Significance given to every single detail and view to the pool and / or to the sea. The Main Restaurant "Athina" with open-air patio in garden offers breakfast in buffet style. The Taverna - Snack bar "Delfi" next to the main pool offers during the day a large selection of Snacks. The Main bar "Dionysos" in the central pool area offers exciting cocktails and beverages in a cozy atmosphere. The Pool bar "Alexandros" located next to the sea, operates morning till midnight offering refreshing drinks and cocktails. Meeting room: for 80 persons with TV and video facilities. TV corner with SAT-TV and Video, rest room, car parking facilities etc. Mini club "Mickey Mouse" ............ for our young friends. Tow spacious outdoor swimming pools plus a children pool. Animation team for morning events like gymnastics or evening events, show programs and night entertainment, volleyball field and playground etc….